The following article from The West Australian newspaper gives interesting descriptions of the Roebourne township of 1885 and, with regards to the murders, of the Union Bank and its surrounds. Complimenting the descriptions are engravings that were made at that same time period. …………………… The township of Roebourne stands on the western bank of the Harding, and is built on the slopes of Mt. Welcome, distant nine miles from the port of Cossack. The town contains about fifty houses, including a Church (English), Mechanics’ Hall, Government School, Residency, and a new stone building now in course of erection, which is intended for police quarters and lock up. The “North West Australian Mercantile Company, Limited” occupies a good substantial stone building, from which the wants of the neighbourhood are supplied. The hotels provide entertainment for man and beast, but at times when the races are on or steamers arrive the accommodation is limited. Upon approaching Roebourne a stranger is struck with the peculiar aspect of the buildings, which are of a varied and motley description, and nearly all presenting a low squab appearance. They are chiefly of wood, with roofs of corrugated iron fastened down with stout battens firmly bolted through the rafters. Upon closer examination the rafters will be found bolted to the wall plates, and in turn the latter are clamped down to the uprights. 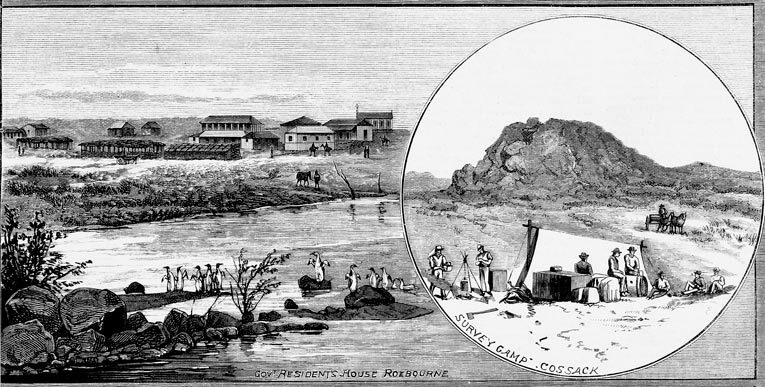 When inquiring why such a quantity of iron is used, the reply is, “willy willy,” the native word for cyclone, the meaning of which is very clear to all who have resided a few years in Roebourne. It is now over three years since the last severe willy willy passed over the town, and traces of the whirling blast may be seen in sheets of iron, crumpled up like brown paper. Of late years a few substantial stone and brick buildings have been erected, including the nice little Church, “all stone,” standing on one of the spurs of Mt. Welcome, and forming a conspicuous Land mark for many miles, the only drawback being its smallness; on several occasions it has been full to overflowing. The Residency, built of brick, stands on a hill with a gentle slope to the river, and in, I consider, the best situation in Roebourne. Here the Government Resident has a comfortable home, although for many years he had to put up with rather rough quarters. The public school is a roomy wooden building, but is open to the morning and afternoon sun which shines on the unfortunate scholars and teachers with terrific force. It surely would not cost much to protect the windows with a verandah at each side. There is another peculiarity in connection with this school which certainly should be bought to the notice of the governing body, that is the long hours kept for such a climate, viz., from 9 a.m. to 12 and again from 1 p.m. to 3, the latter term being the very hottest part of the day, and only those who have lived a summer in the tropics know how hot that is. Yet some of these unfortunate children have to walk perhaps a quarter of a mile, to and from school, in the broiling sun. The powers that be, seem to think that school hours suitable for Albany should be equally suitable for Roebourne, but let those who think so spend the afternoon two hours in this particular school and I think they will admit when they see poor little urchins sleeping at their desks, with perspiration oozing from every pore, that it is positive cruelty, and can only lead to disastrous results, both mentally and physically. In my opinion school hours in this climate should, in summer, commence at 8 a.m. and end at noon. Now were a lot of native children treated in this manner, the matter would be at once reported to the Aboriginal Protection Society, who would quickly come to the rescue. I should be sorry to cast any reflections upon the School Board at Roebourne who evidently are of opinion that they must accept the hours laid down by law, but which they can scarcely approve. Immediately to the south of the School house, and within 40 yards distant, is a low weatherboard cottage, occupied and used by the Union Bank, where the late terrible tragedy took place-the heartless murder of Messrs. Anketell and Burrup. It is difficult to conceive how such a diabolical crime could be perpetrated, unheard by some of the immediate neighbours, as considerable noise must have been occasioned. The residence of Mr. A. McRae is almost directly opposite, with only a narrow street dividing the two buildings, and to the north, adjoining Mr, McRae’s, are several occupied dwellings, whilst to the south of the Bank, about 80 yards distant, reside a family named Law who were frequently disturbed during the night by the barking of their dog. The Bank building has a verandah in front, facing the east, and extending along the southern end and back. The south-west angle is boarded up, thus forming a small lean-to room with window opening to the south. In this room the accountant, Burrup, slept with his head about twelve inches from the window, which no doubt was open at the time. The Manager slept on a stretcher at the opposite or S.E. corner of the verandah, about 14 feet from Burrup’s window, both men with their feet to the north. The murderers doubtless approached from the spinifex to the south of the building and attacked the sleepers simultaneously from the verandah, after which the back window of the main building was broken open and the Bank entered. It is to be regretted that the police did not directly upon the discovery of the crime keep the crowd away until the black trackers were put on, which should have been done at once as several were available, and I understand were offered to the police, when there is little doubt they could have picked up the tracks about the building and have followed them up. A free pardon is offered by proclamation to any person or persons, not concerned in the first or second degree, who will give such information as will lead to conviction.